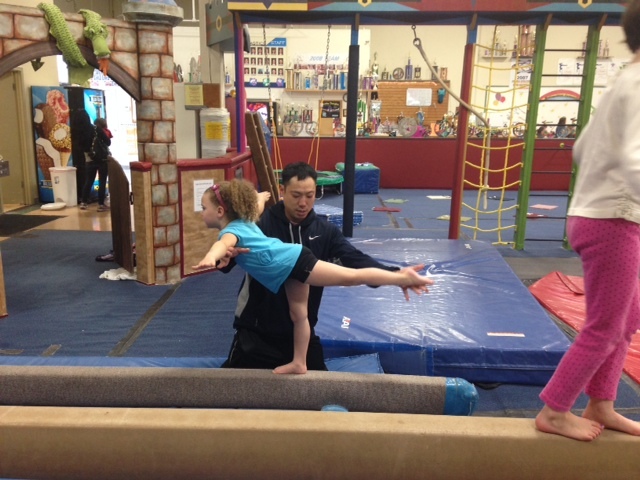 Pre-School Gymnastics – Welcome To Metropolitan Gymnastics! Fitness-Experiencing fun associated with fitness activities early in life can create life-long positive fitness habits. Mental Focus-Learning how to concentrate on a task and achieve goals. Balance-Walking on beams can transfer to other balance skills. Social Skills-Taking turns, working with partners, sharing and making friends. Strength-Climbing on bars and ropes develops muscle strength. Coordination-Hand-eye coordination improves writing ability while eye-training improves reading readiness. The Sport of All Sports! Gymnastics prepares kids for all sports! Our preschool programs are divided by age group and ability. At the end of each class, children will get 5 minutes of free play in our primetime play center. (Parents supervise children during this time.) Class curriculum is designed with age appropriate activities and circuits to keep children active and moving. Our preschool staff is highly motivated and enjoys working with children! Preschool classes are available on evenings and on Saturdays. If you are interested in pursuing the competitive gymnastics route, please check out our Hotshots program available to advanced 3 and 4yr old girls and boys. Parent & Tot – (Walking to 4 years) – 45 minutes – Co-ed Each class is designed to provide children with challenging, age and developmentally appropriate activities. We will focus on balance, strength, gross and fine motor skill development all while having fun and experiencing success! Enjoy watching your child grow and interact with other students in class! Coaches set up circuits to introduce exciting ways for you and your child to play and learn gymnastics based movement! The last 5 minutes of class is reserved for exploration of the gym! “Free time” is a perfect time to run, bounce and climb! Gymsters – (3 and fully potty trained to 4 years) – 45 minutes – Co-ed Each class is structured to provide children with challenges and excitement based on his or her comfort and ability level. Students will be introduced to all gymnastics equipment throughout a two week timeframe. New target skills and circuits will be provided to continue building strength, agility, confidence, coordination and social skills. This class can benefit a first time gymnast as well as a “veteran”! The Hotshots class provides young gymnasts with an opportunity to develop a foundation for competitive gymnastics through learning fundamental gymnastics skills. This class incorporates circuits, strength, event work and play to give each gymnast a challenging and rewarding experience.